Author’s note: welcome back! I’ve been on a temporary hiatus, very busy with something you’ll find out more about — although not much — if you find the lede buried near the bottom (it won’t be hard). Hopefully I’ll now be back to writing more regularly — especially if BVW gives me good things to say regularly. Fingers crossed. I was missing baseball yesterday. Missing it something awful. Before I fell asleep I listened to “Meet The Mets” twice in a row, that old version from the 1980s that they used to play before Mets Extra on the radio. 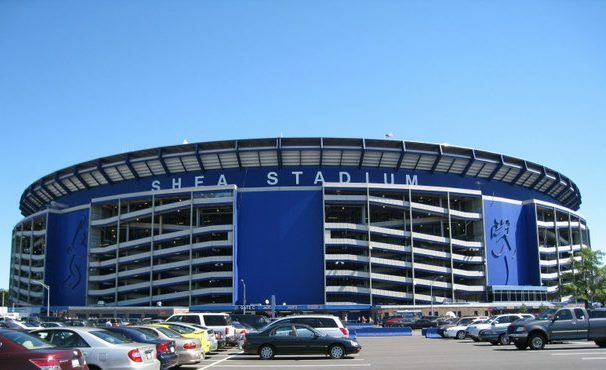 Hot dogs, green grass, all at Shea…it’s been a while since we heard that song in the proper context, hasn’t it? One of the reasons I was missing baseball so much, I think, was that it was warm outside, and I’d temporarily abandoned my winter coat for my Mets jacket. I think the last time I wore it was the day after Closing Day, right before it started to get cold. I’m always wearing that jacket, and usually I leave something in the inside pocket, and yesterday, as I was walking back to my apartment, I reached into the inside pocket and pulled out a folded piece of paper. It was my ticket to Opening Day 2018, that romping win over the Cardinals. Inside was a folded Mets pocket schedule. I took a second to look at them both, then tucked them back inside my jacket, where I presume they’ll remain until Opening Day 2019, 114 days from now. This is only the most recent in a long line of Mets jackets, for me. For most of us, I would imagine. I got my first one for Christmas in 2004, replaced it in 2009 or so with the new model; that one disappeared, so I got a different one that was lighter, the black one with blue and orange around the sleeves that you can see Willie Randolph wearing in photos from his time — which now seems brief, when we look back on it — in Queens. Got a varsity-style jacket festooned with all sorts of patches and decorations in 2012, give or take, and a few years ago, a starter jacket, the vintage kind that MLB revived ever-so-briefly, just long enough for me to snag one. My primary Mets jacket at the moment is the field model from a few years ago, blue with orange under the arms and down the sides. When I got home I put that jacket away, ticket and schedule still in the inside pocket, and it’ll probably be a long time — winter, give or take — before it’s warm enough to wear it again. That’s one reason I was missing baseball. The other was simpler. We were in the middle of trading for a couple of All-Stars, and it was so exciting I felt for a moment like it was 2006 again, and I was fielding grounders with my dad on a cold field in early April. I asked him who was in first that day, and he said the Mets were — of course we were; in 2006 there wasn’t a day of the season we weren’t in first. But it’s early, he said. Doesn’t matter who’s in first in April. I went back to fielding grounders, but I knew he was wrong. We were so dominant in 2006, so unbeatable, that I knew first place in April meant first place in September. We’re nowhere near that level right now, of course: we haven’t been since Yadier Molina took Aaron Heilman too deep for even Endy to catch. But there’s an offseason excitement, I must say, that I don’t think we’ve felt since 2006. And I can’t help but like it. However you feel about the trade that brought us Robinson Cano and Edwin Díaz, you must admit that it’s made things mighty exciting. I’m of two minds, personally; there’s nothing wrong with Cano and Díaz on their own, but I can’t help thinking we didn’t need to give up our young friend — as I’ve come to think of him — Jarred Kelenic in order to land them. But either way, the 2019 Mets just got exciting, and word is there’s even more on the way. Corey Kluber? We’ve inquired. Bryce Harper? Not ruling him out. Noah Syndergaard? On the market — maybe. I can’t even conceive of any deal worth parting ways with Thor, but if trading him is enough to bring us a star center fielder to play between Nimmo and Conforto, or a catcher who can hit (if those even exist anymore; Thor’s worth way more than J.T. Realmuto, and I can’t think of anyone better), then you have my blessing — go for it. It’s been too long, far too long, since we went all-in on win-now. We did it in 2005 and 2006, then tried to prop up what we’d built with Jeff Francoeurs and Ryan Churches and players of their ilk, and when that all fell apart, we were done. Even in 2015, we weren’t all-in. We won the division and had a run that was nothing short of magical, and I’m not saying for a moment that I would trade 2015 for anything, but we could have been more dominant. We could have spent more, and brought in another star or two, and gone from a division-winner to a juggernaut. Gosh, I miss being a juggernaut. I’ve been working on a book about the Mets — I know, talk about burying the lede — and in the course of doing so, I’ve remembered just how good the 2006 Mets were, and how quickly and easily I fell in love with the team. Remember that lineup? Reyes, of course, then Lo Duca, then that immortal 3-4-5, that trio of legends. Beltran, Delgado, Wright…I can’t think of lineup with a more fearsome heart, although I’m sure one or two have existed. There’s a reason we won 97 games in 2006 with a pitching staff that was average at best: our offense was otherworldly. Ridiculous. By OPS+, the worst hitter we had who appeared in at least 100 games was Endy Chavez — whose OPS+ was still 101. He batted .306 that year. That was our worst hitter. Just think of the lineup on a typical night. First it was Reyes, .300/.354/.487 hitter, 19 home runs, 64 steals. Then Lo Duca: .318/.355/.428, from the catcher’s spot, for goodness’ sake. Then Beltran — .275/.388/.594 — and Delgado — .265/.361/.548 — then Wright — .311/.381/.531. Filling out the lineup we had José Valentín — .270/.331/.490 — and Endy — .306/.348/.431 — and one more outfielder, Floyd or Nady or whoever happened to be with the team that night, both of whom could also hit. It was heaven. It was bliss. Each and every night, games began with opposing pitchers terrified. And here’s the thing: Mets fans need reason to dream again. We need something to believe in, not a wildcard squeaker or the silver lining of an 83-79 finish, but a team that blows us all away. And it seems that GMBVW, as we’ve come to know him, wants the same thing. He’s not one for calm and caution, he seems to be shouting at us. He’s in it to win it — and to win it right now. And maybe it all blows up in our face, and we’re stuck with an albatross contract for a 40-year-old second baseman and a reliever who fell apart after a good year or two. But maybe it doesn’t. And the fact that the possibility is there — that’s almost enough already. Not quite enough, of course. The most important part of this deal is that it must be — it has to be — the first of many. We’ve not done enough, not yet. And all indications are that BVW knows this. It’s going to be a wild offseason, we keep hearing. Buckle in. Things are going to get exciting. Now that’s what we need. We had our reassuringly competent team (2014) and our underdog pennant-winners (2015) and our gutsy fighting team (2016), and then we had two teams that are barely worth mentioning. It’s about time we had an exciting team. A team worthy of New York. A team that can bring us back to the promised land, or barring that, a team that strikes just a bit of fear into opposing pitchers. There’s an offseason ahead of us, and all sorts of things that could happen, and somewhere out there is a team of 25 players that can win us a championship — and quickly. Can Brodie Van Wagenen put that team together? Maybe. But the deal he’s just done tells us one thing: successful or not, he’s finally giving it a shot. Anyway, this was all yesterday, as I said. In bed, I listened to “Meet The Mets” a few more times, and eventually I got to sleep. Woke up this morning, and wouldn’t you know it — it was still warm. So I left my winter coat alone for another day, and put on a Mets sweatshirt. It’s a new one, an orange and blue ordeal I just picked up a few weeks ago. The only Mets team this sweatshirt has ever known is the one with Robinson Cano at second and Edwin Díaz in the bullpen and Brodie Van Wagenen in the office making move after aggressive move. In other words, the only Mets team this sweatshirt has ever known is a Mets team that badly wants to win. It’s not a bad way to get started, as Mets sweatshirts go. And for all those other Mets jackets…well, suddenly, I’m increasingly optimistic that the 2019 Mets will prove a sight for their sore eyes.